My red-eye flight landed in Siem Reap at 7.30 am local time, and the first sentence I heard once I set my foot out of the airport was “Hey! Tuk-tuk?’ from several tuk-tuk drivers with eager expressions on their faces, vying for business. In case you haven’t seen them around Beijing, a tuk-tuk is a combination of motorbike and trailer, and it’s the main local vehicle in Siem Reap. It gave me the idea that I’m in a less-developed country, while the first thing that came to my technology-spoiled mind was to order a taxi via Didi. Cart selling cheap Cambodian street food. I was a bit blurry-eyed from the overnight flight, but I was soon wide awake from the excitement and didn’t take my eyes off the changing surroundings during my tuk-tuk journey from the airport to my hotel. To be honest, Siem Reap doesn’t stand out as charming at first sight, with its dusty roads, shabby buildings, and chaotic traffic. But once I got further away from the downtown area, this Southeast Asian city started to show its unique character: colorfully-decorated low houses, carts selling local street food, and pantsless children running wild around the place. After checking into my hotel, the first thing I did was rent a bike. For that I paid a USD 40 deposit, and USD 2 for one day’s rental. 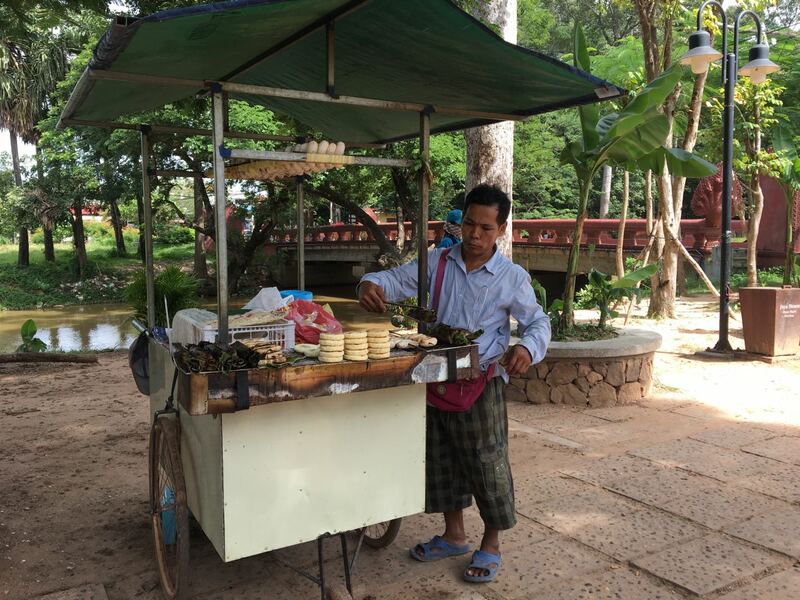 Siem Reap is not a big place, so it’s perfect for biking, which allows you to explore different parts of the city that you probably would never discover otherwise. It took me around 30 minutes to cycle all the way to Angkor Wat, the country’s prime attraction for visitors. There are several entrances into the temple complex, but tickets are only available at the Angkor Ticket Center, located 5 km away. The ticket costs USD 37 for a one-day pass, and USD 67 for a three-day one. The ticket comes with a map showing where all temples are located. 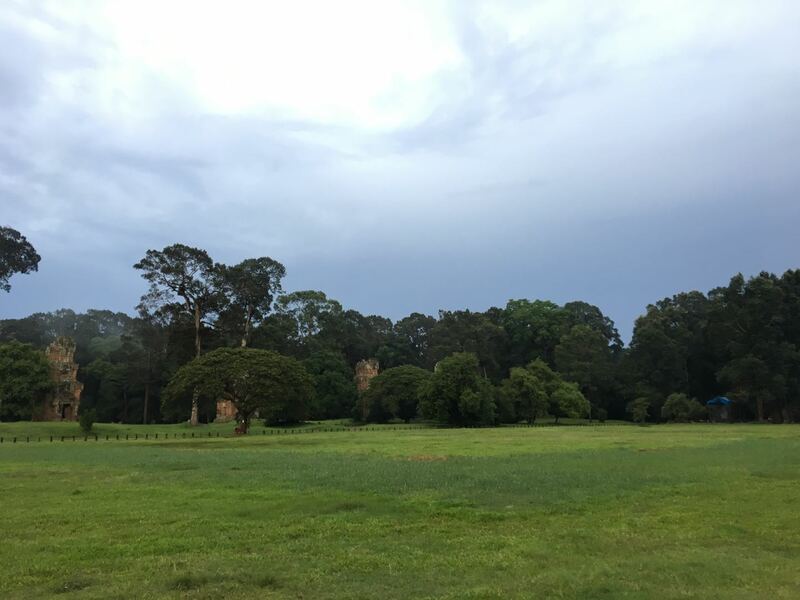 Numerous as they are, three days should be more than sufficient even for those prefer a less whirlwind, Instagram-oriented tour. 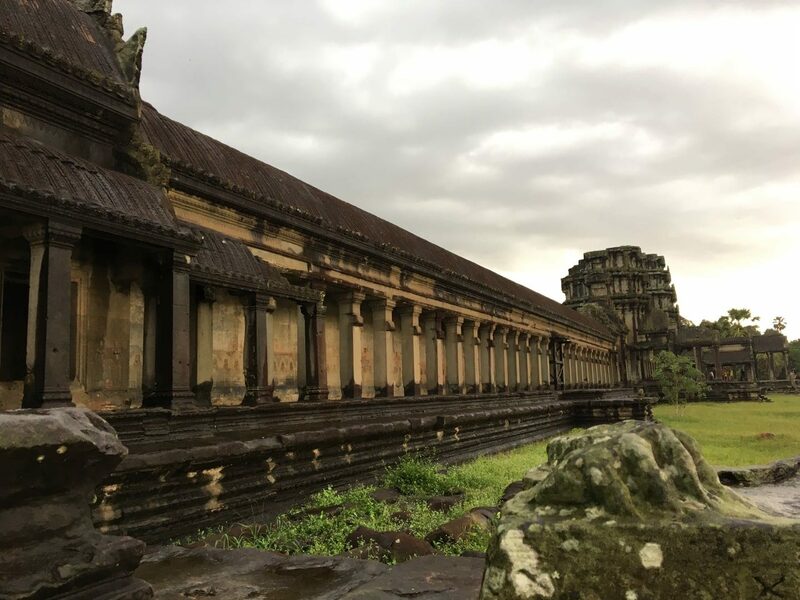 A list of the top 10 Angkor temples includes Ta Keo, Banteary Kdei, Pre Rup, Preah Khan, Angkor Thom, Ta Prohm, and Phnom Bakheng, which is located on top of a hill and has became a popular tourist spot for sunset views. I only got to see four of these listed temples because of my limited time, but I was really able to feast my eyes cycling around the temple complex area after a heavy rain washed away many of the tourists. Another highlight of Siem Reap is the Old Market, next to which is Pub Street. The whole street is peppered with restaurants, clubs, and bars catering to non-locals. It’s also a land of cheap but great massages, including the wildly popular fish foot massage. Serene scenery in the Angkor temple complex area. For those who’d like to learn a bit more about Khmer art and culture, Angkor National Museum is the place to go. The ticket fee is USD 12 at the gate, or USD 9 if you book online. 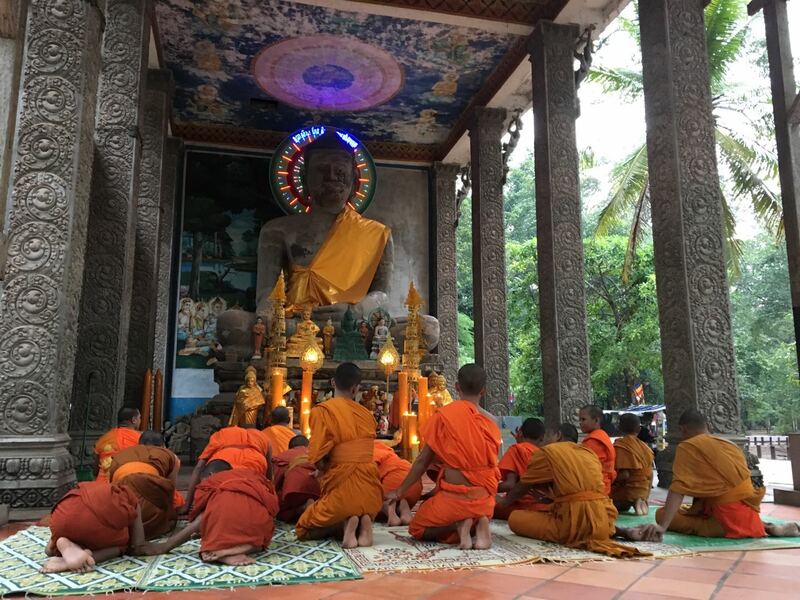 I was amazed by the large collection of Buddha sculptures dating from the Khmer Empire’s Angkor period. Language is no problem for English speakers there; most locals, including the tuk-tuk drivers can handle basic conversations in English. I tried to learn some useful phrases, and asked a local how to say “thank you” in Khmer, but it’s pronounced very similar to a rude word in Chinese so I didn’t bother to use it. 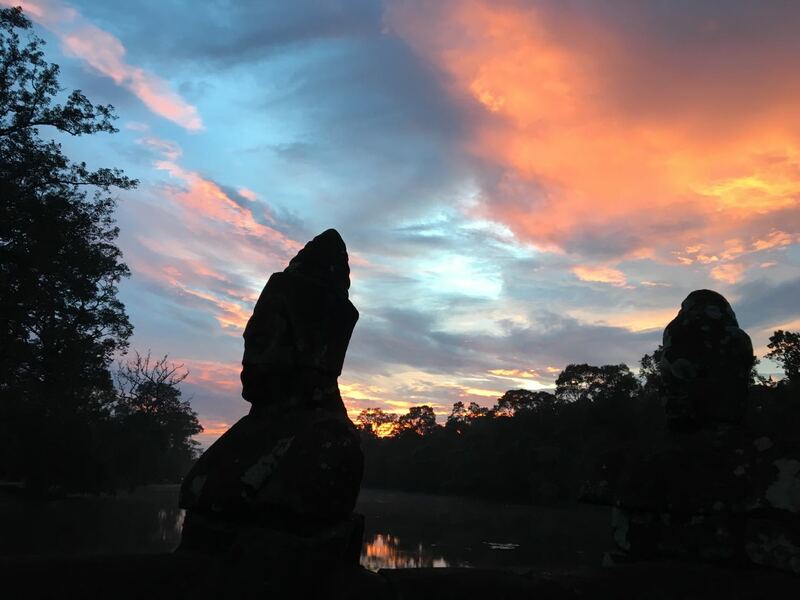 On the whole Siem Reap treated me well – with the exception of the food. I was intending to try out lots of traditional Cambodian dishes, but I’m not a very adventurous eater, and one of the popular local street foods, barbequed balut – unhatched baby chickens – was a step too far for me. I bid a wistful farewell to Siem Reap, and headed away to Phnom Penh via a five-hour bus trip. For bus ticket services from Siem Reap, check here. It’s a convenient way to travel to surrounding cities.